With the rapid development of the semiconductor lighting industry, how to deal with the increasingly prominent problem of standards has become a common challenge faced by governments and various standardization organizations. On January 1 this year, nine semiconductor lighting industry standards developed by the Working Group on Semiconductor Lighting Technology Standards of the Ministry of Industry and Information Technology were officially implemented. Recently, in 2010, the national semiconductor lighting electronics industry standard release and publicity conference was held in Jiangmen City, Guangdong Province. Representatives and experts believed that the release and promotion of standards will help guide the industry from disorderly to orderly competition. The newspaper reported on the content of the conference in the 14th edition and the 15th edition today, and extracted some wonderful views. Standardization work includes three steps: standard setting, implementation, and supervision. The implementation of standards is an important task of standardization work, and an important process for transforming standards into productivity. Only when standards are implemented seriously can they be in production management and enterprises. Play a role in business activities. At the same time, the implementation of the standard also enables us to continuously test the standards, find problems and better improve the standards in practice. Zhao Ying, senior engineer of the China Electronics Standardization Institute and secretary general of the semiconductor lighting standard working group, said that since these nine standards are recommended standards, they are the standards that enterprises adopt voluntarily, and â€œenterpriseâ€ is the main body of standard implementation. It is hoped that enterprises can formulate their own "enterprise standards" according to these standards, especially the detailed product specifications. In the production and sales process, the products are inspected strictly according to the relevant provisions of the standards, and the data is accumulated in the process of using standards. Improvement provides a scientific basis. Zhao Ying hopes that local governments should encourage enterprises to implement standards, such as giving some incentives or preferential policies to the enterprises. Yan Tongsheng, chairman of Hangzhou Zheda Tricolor Instrument Co., Ltd., said that at present, the promotion of LED standards in Japan and the United States is relatively strong, especially in the United States, where the international influence of standards is great. China's promotion of LED standards is not bad at present, China's LED standards are not worse than the United States in some aspects. In terms of longevity, the US standard is more than 6,000 hours, which means that it takes 10 months. The LED industry is developing very fast, and the 10-month time is too long. This standard is very poorly enforceable. China is also studying the standard of LED life, how to accelerate aging is also in the study. At present, China has accumulated certain experience in the research of LED life. In the future, we will cooperate with relevant American associations to jointly study and formulate relevant standards, which is also conducive to establishing China's position in international LED standards. In addition to technical issues, there is a need to address standard issues for a wide variety of LED devices that are widely used and semiconductor lighting products that are different from traditional light sources. Industry needs standards to guide production and application, standards are required to provide testing and testing methods, and standards are required to regulate the market to promote trade. It is extremely urgent to establish a standard system and develop relevant standards. In view of this, at the end of 2005, the Ministry of Information Industry established the Working Group on Semiconductor Lighting Technology Standards, aiming at all aspects of the society within the United Nations, developing the technical standards system for the semiconductor lighting industry and materials, chips, packaging and application products in the industrial chain. Research and development of standards such as basic standards, method standards, and product specifications. It is understood that since the establishment of the Standard Working Group, there have been 54 member units, including the production, learning, research and use of the semiconductor lighting industry chain. In recent years, a semiconductor lighting technology standard system has been developed. A large number of standard development work was carried out around the middle and the middle of semiconductor lighting, and achieved fruitful results. The release of the nine standards is only the first step in the standardization of semiconductor lighting technology. There is still a long way to go to improve and perfect the standard system. The long-awaited standard of the entire industry was officially introduced at the beginning of this year, which is of great significance for regulating the development of the industry. With the development of the industry, the revision of the standard is affirmative. The standards published this time are technically strong, and the changes are not inconsistent. There should be no major changes. The standards released this time are recommended standards. These standards are authoritative and can be said to be the "fundamental Dafa" of the regulated industry and the basis for enterprises to develop their own corporate standards. The standard is macro, each manufacturer is microscopic, and each manufacturer must also develop its own corporate standards in accordance with these standards. The so-called standard setting must pay attention to the application, starting from the practical application, so that the standards formulated can form their own characteristics. In the process of aligning with international standards, there will be differences. It is okay to have different places. As long as they meet the actual application conditions, we should affirm the standards from practice. It is necessary to establish a standard based on the application based on the application. There are a number of application standards that are urgently needed. It is recommended that the Semiconductor Lighting Standards Working Group of the Ministry of Industry and Information Technology take the lead in incorporating application standards to promote and standardize industry development. Chairman of Hangzhou Zheda Tricolor Instrument Co., Ltd.
After the publication of the standard, it is necessary to actively carry out propaganda and implementation, and to conduct training, so that enterprises can have a deeper understanding and understanding of standards. It is not enough to set standards and publish standards. Follow-up work should be followed up, and companies should know how to apply these standards. In the future, it is necessary to let the standards work, to form an atmosphere of application standards, and to let enterprises consciously use standards, and enterprises need a certain level of standards. The nine standards issued this time are not mandatory. Government and industry authorities should encourage enterprises to apply standards and use standards. In addition, the users of the application side should understand the standard and require the front-end enterprises to supply the standard, thus forming an atmosphere of the entire market application standard. Strengthening the construction of the standard certification platform can be done from three aspects. The first is that the government supports the establishment of a national-level testing platform and certification platform to support the implementation of standards. This is an important point. Second, it can emulate foreign practices, such as voluntary certification in the United States. The EU has had more compulsory certifications in the past, and there has been a trend toward voluntary certification since 2008. Third, the support and promotion of local governments, such as the establishment of standardized enterprise certification, in the taxation and other aspects of preferential treatment. This will gradually establish an atmosphere of application standards. LED is an emerging industry and there are many standards to be developed. The entry of LED into the general lighting field is still in its infancy, and has not yet developed into a mature market. The development of standards should focus on the basic standards and common standards. Especially for the application-level standards, there is still room for improvement in understanding. The application products are developing very fast. Therefore, it is necessary to consider common and basic standards when formulating standards, and it is not appropriate to be too detailed. 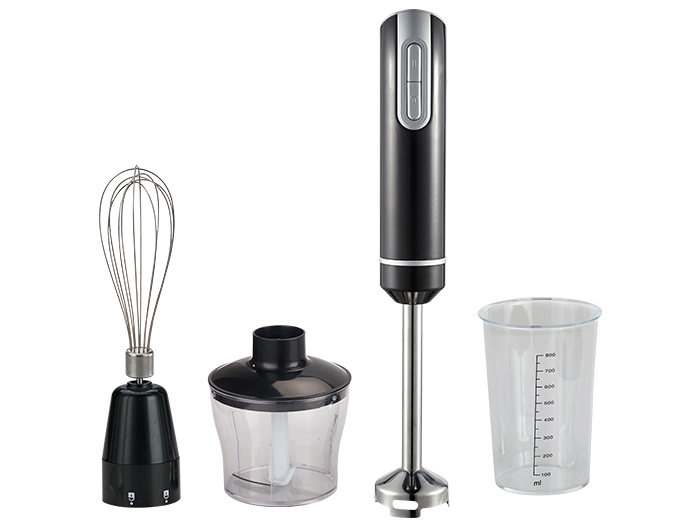 Hand Blenders 4 In 1 are the full set hand blenders series, with Stick Blender, chopper jar, breaker cup and egg whisk. They are more multifunctional. Next: Bringing together the world's leading optoelectronic technology and display technology departments to jointly create "2010 Shenzhen Photoelectric Display Week" and "Shenzhen (International) Color TV Festival"